Greetings and welcome to 2014. I should probably say something about how long it's been since my last post, and how I have resolved to post more frequently this year, but I'm going to skip all of that and jump straight into my "resolution" for 2014. It comes from two women who displayed two traits I want to emulate; Faith and Courage. The first woman is one you know very well. She is a teenage girl who loves God, and loves her soon-to-be husband. Her life is on a good path, one probably similar to many of her friends and family. Love God, find a good husband, raise a good family, and serve others. However, one day her life was dramatically, and I say it again, DRAMATICALLY altered forever. Her name is Mary, the mother of Jesus. The other girl also loves God. She is a Jew, living in the land of Persia, named Esther. Her life too took a dramatic turn when she was selected above all others to be the next Queen. Esther has an uncle, Mordecai, also a Jew and servant of God. Mordecai, and all the Jews living in Persia for that matter, have enemies...especially one powerful enemy named Haman. Haman was the King's right-hand man and he tricked the king into signing a law that would have Mordecai and all the Jews (including the new Queen) murdered. Mordecai challenges Esther to do something that is punishable by death...he challenges her to enter the King's chambers, un-bidden, and unveil the entire plot to the King in order to save the Jews. (For a fuller summary of this amazing story, click here). Both of these women's stories are amazing and worth much more than I've said, but for the purposes of this post, I want to laser in on one thing...how these women responded to the unexpected turns in their lives. The Bible is filled with examples of people who God used, who were at first very reluctant to do what He had asked of them, some even asking for special signs (see Gideon). And yet here we have two women who showed incredible courage and faith in the midst of life-altering news. The Path to Live By is this: When God asks, I act; quickly, immediately, with courage and faith. That's what I see these two women doing, and that's what I want my life to be marked by. This is what I want for my life in 2014. I want to look back at 2014 and see a pattern of quick and immediate obedience to whatever God asks of me; in small things, and big. I'm not there yet...not even close. I am in the camp of those who question and hesitate...but I want to change that trend, and move to the camp of the faithful and courageous. 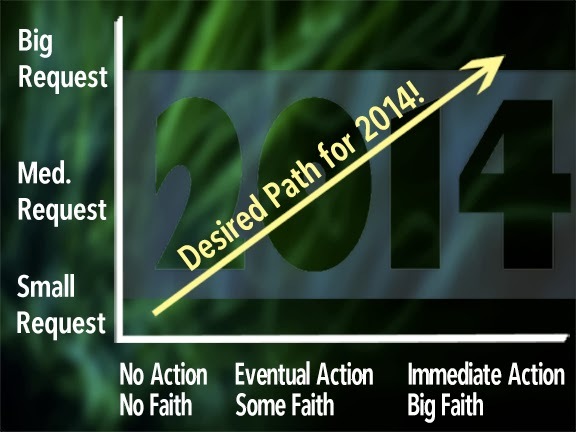 I look at it like this graph I put together...sometimes God makes small requests of me, sometimes big. I need to "train" myself with the small asks, so I'm ready for the big ones. I want it "Up and to the Right." It starts today! What is He asking of you?